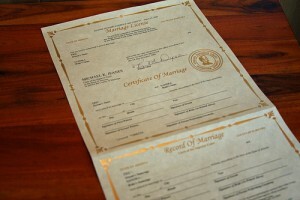 While planning your wedding in Arizona, you will need to obtain a marriage license in Arizona. Marriage licenses have been delegated by The Superior Court of the State of Arizona, to be issued by each and every county. A wedding license issued by any AZ County is valid as a license for marriage in any AZ County (for instance, you can use a Maricopa County Marriage License in Pima County, etc.). Once purchased, the marriage license must be used within one year. If either partner intends to change a name after the ceremony at The Social Security Administration or Arizona Department of Motor Vehicles, a certified copy of the stub will be needed. In most counties a certified copy can be prepaid at the time you apply for the license or paid any time afterwards. The County Recorders office will mail it directly to you when properly filed by your minister or judge after the ceremony. NOTE: Certified Copies are believed to be free for active members of the military. Ask when you apply. Y our Arizona Wedding Officiant, Minister, Priest or Judge must record the marriage license stub within 30 days of the ceremony. Some of us offer complimentary expedited service. Your county marriage license allows any judge or duly ordained minister to officiate your wedding ceremony. All county marriage licenses must be signed by the couple, two witnesses age 18 or over, and the officiating minister. 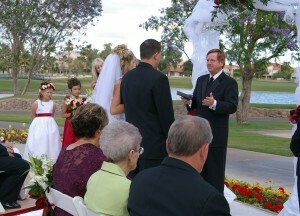 We have many years of experience helping couples be married in Arizona. To speak with an Arizona Wedding Minister or Civil Wedding Officiant, just call Phillip or Gwen Waring in Phoenix, Arizona. 480-502-0707. Please call anytime between 8:00 a.m. and 5:30 p.m. (Arizona time) as our office phone rings at home all hours for ministry emergencies. Presented by Arizona Ministers | Free Marriage License Information.